History Detectives searches for connections between a collection of unusual paintings and the largest job creation program in America's history. FDR’s New Deal work programs will put more than 8 million back to work. And not everyone is laying roads and mixing cement – the program also employs over 40,000 in various arts projects. This unprecedented harnessing of artistic talent will create thousands of paintings, sculptures and murals for public buildings across the country. But today, nearly a third of this artwork is missing. What happened to these important pieces of our nation’s history? Evelyn Cook of Molalla, Oregon, has inherited some paintings that may be part of this lost work. Created by her aunt, Thelma Johnson Streat, she believes they were mural studies commissioned by the WPA in the 1930’s or 1940’s. 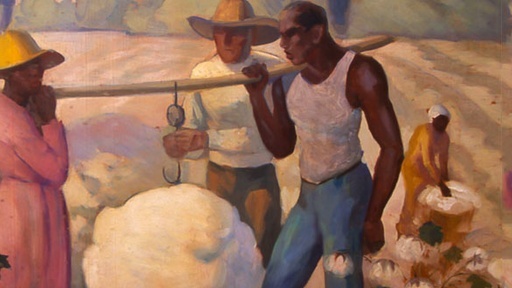 The color illustrations depict contributions of African Americans in the fields of medicine, transportation and industry. Did any of these studies become murals and do any of Streat's murals still exist? Related Investigation Black Star Line Is this certificate a rare artifact from the heyday of Marcus Garvey? Also in Depression and WWII: 1929-1945 Diana How did this alleged lesbian autobiography escape censorship in the 1930’s? Also with Elyse Luray Cromwell Dixon Plane Fragment What could this faded scrap of fabric tell us about the first pilot to conquer the Continental Divide? Also in Depression and WWII: 1929-1945 Ernie Pyle's Typewriter Did America’s most beloved battlefront correspondent bang out his dispatches on this Corona 3?